This summer, I signed on as Food Columnist for CBC Radio’s All in A Day. In this segment, I explain why the humble egg might be enjoying a moment in the spotlight. It’s turning up many of Ottawa’s most fashionable menus, not just as an ingredient in a sauce or soufflé but in its pure white-and-yolk form. Here’s an excerpt, but to listen to the segment, please visit the All In A Day website. So why do you think we are seeing eggs popping up in more places now? Well, I have a few theories about this. First, eggs fits perfectly into the upscaling of the downscale trend –that’s the same reason we are seeing burgers and onion rings turning up at high-end restaurants. Fine dining has been all-but replaced in recent years with restaurants that seem to cater to an appetite for childhood comfort foods – familiar food and simpler, less fussy dishes that put diners at ease. 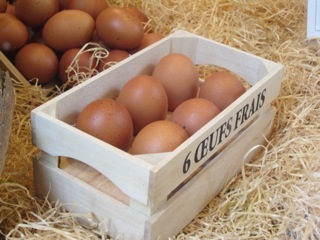 The second reason, which is related to the first is that eggs are perceived as being a natural, farm-fresh, home-y food. And that seems to have great appeal these days – whether that’s because we’re in tougher economic times or because of the impact of the local food movement, eggs are the symbol of a time gone by, when farmers ruled the food system and not the other way around. And finally, I think eggs have great appeal for chefs because it’s a cheap way to dress up a plate and when the yolk is runny, it creates a luxurious sauce and adds instant voluptuousness to a dish. Do we know where this trend got started? Again, I have my theories. In the case of devilled eggs – which are those hard boiled eggs, cut in half and filled with their yolks that have been mixed with mayo and mustard — I think it’s the Mad Men effect—an obsession with retro cuisine. I guess you could call it a trend within a trend really, especially in New York where I understand it’s tough to find a gastropub that doesn’t feature devilled eggs on its bar snacks’ menu. But Ottawa’s on to it too. The other day I noticed a devilled egg on the menu at Beckta Dining & Wine where it accompanies a lamb tartare appetizer. So devilled eggs have made a comeback alongside a popular TV series, where else does the egg trend come from? If I had to guess, I’d say this new wave of egg-as-culinary-star, could probably be traced back to one single chef: David Chang of the critically-acclaimed Momofuku restaurant fame in New York. He is often credited with being at the forefront of the dining-culture shift in North America. He is probably best known for his ramen: big bowls of noodles in a pork-based broth. Chang’s famous ramen is at the other end of the culinary spectrum – it’s unbelievably labour-intensive. In fact, when he wrote out all of the steps for his recipe, it was 20 pages long! Every bowl of ramen is topped with a perfectly poached egg and in fact people marvel at just how perfectly poached it is. The other dish that he is famous for s is a soft-cooked egg that has caviar spilling out of it–people apparently go nuts for this thing too. One time I was interviewing Bridgehead’s owner Tracey Clark and found out she is a fan of Chang’s soft-boiled egg – it’s called a 5:10 egg. It’s written up in detail in the Momofuku cookbook but basically you place an egg in boiling water for exactly 5 minutes and 10 seconds and then put in an ice bath. It leaves the yolk perfectly gooey and the white just set. So Chang has inspired home cooks to become re-acquainted with the soft-boiled egg? Yes, I think that’s fair to say. He definitely has people talking and thinking about eggs. And now, in addition to his small empire of Manhattan restaurants, he has launched a new food magazine – a quarterly – called Lucky Peach. The first issue which came out in June is The Ramen Issue. And get this — it dedicates 18 pages to the egg. There are seven elaborate egg recipes including what Chang calls the most famous egg dish in the Western world – one that was created by French Michelin-starred chef Alain Passard. So is anyone making Chang-style eggs in Ottawa? Perhaps the closest thing we have is the Son-in-law egg at Side Door, a relatively new restaurant in the Byward Market. Apparently Son-In-Law-Eggs are a traditional Thai celebration dish that is eaten on New Year’s day or at wedding feasts. At Side Door, the egg is presumably soft-boiled before it is panko-crusted and quickly deep fried so that its soft yellow centre oozes gracefully when you cut into it. It is served with chili jam and fried shallots. Delicious. So do you expect this trend to stick around for a while? Absolutely. And that’s just fine with me. I have been a bit of a late bloomer when it comes to egg appreciation and until recently I’d say I may have underestimate its amazing versatility. And meanwhile with so many chefs getting clever and creative with eggs, I can’t imagine it being just a flash in the pan (sorry, couldn’t resist! ).